So I’ve been limiting my caffeine lately due to some heart issues I have that have been flaring up. It’s a benign condition but it’s really annoying and sometimes painful so I’m trying to figure out what I can do to control them without medication. Out of all the options that cause it to flare up, I have a sneaky suspicion that caffeine is the main culprit so I’m cutting down to either a cup of coffee or a Spark at the start of my day. So you probably don’t want to come to my house around 3 when it starts to wear off. You have been warned. 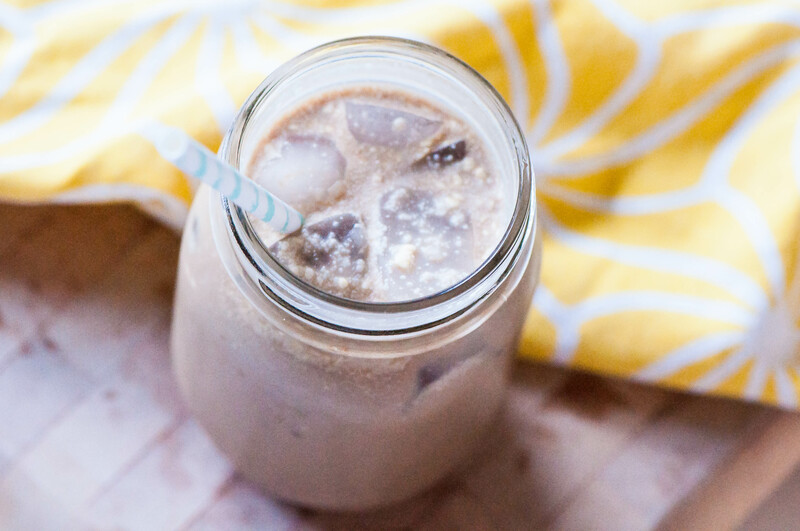 It’s iced coffee season friends and this Creamy Coconut Iced Coffee is officially my new favorite way to get in my allotted caffeine. Although I have acquired a taste for coffee, I still enjoy it most when it’s creamy and flavored. One of my go to flavors in the summer is coconut. The tropical flavor is dreamy and brings visions of white sand beaches. The coconut flavor in this coffee is imparted with an unusual ingredient, instant pudding mix. Simply mix a few tablespoons with half and half (or milk if you want to keep it lighter) and a bit of sugar. Then you pour it over your chilled iced coffee for a deliciously creamy and decadent morning pick me up. I first made it without the addition of sugar since there is sugar in the pudding mix but I personally wanted it a little sweeter so I added some sugar. I love it the way the recipe is written but if you don’t take much sugar in your coffee, try it without and adjust the sweetness according to your taste. The instant pudding mix has shredded coconut throughout so if the slight texture of it in the coffee bothers you, you could everything but the ice in a blender and blend until smooth then pour over the ice. Another reason I love this recipe is the flavor options. Chocolate, vanilla, white chocolate, cheesecake, even Oreo would be amazing. I’m definitely going to be experimenting with some fun combinations this summer. Oh, chocolate pudding mix and chocolate almond milk would be glorious. Let your freak flag fly. Fill glass with ice then pour chilled coffee over it. Whisk together the half and half, coconut pudding mix and sugar. Pour into the coffee and stir with a straw to combine.